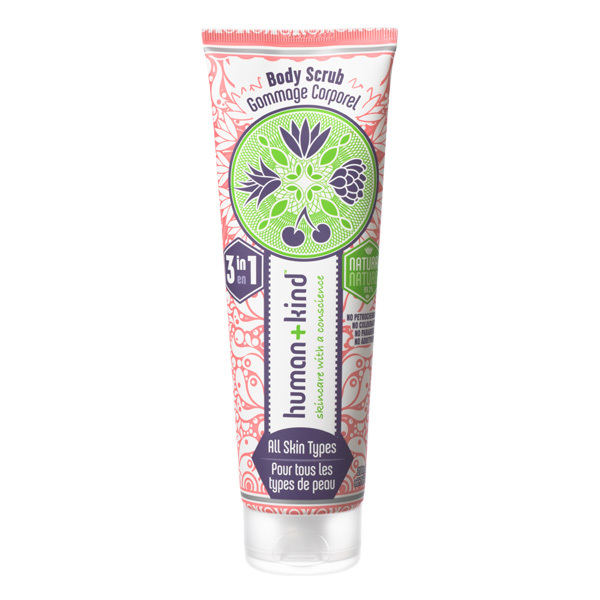 Human + Kind’s 3 in 1 body scrub exfoliates, removes dead skin cell and moisturises skin without irritating it. Instructions for use: Massage onto wet skin and rinse off. For best results, follow up with a product from Human+Kind’s body care range for super soft skin. Aloe Barbadensis Extract (Aloe Vera): Aloe barbadensis gel is a powerful moisturiser, which penetrates the skin supplying moisture directly to the tissues. It is renowned for its soothing and calming effect on skin problems. Aloe improves skin tone and colour by increasing the blood flow to the areas of application. It reduces skin redness, and works with other anti-inflammatory ingredients. Bambusa (Bamboo) Arundicea Stem Extract: Is used as a mild, effective scrub as well as an emollient which can help restore elasticity and suppleness to the skin. It helps to sweep away dead skin cells and clarify pores for a brighter smoother complexion. Centaurea (Cornflower) Cyanus Flower Water: Helps to soften skin leaving it silky to the touch. It has a soothing effect on the skin due to its excellent anti-inflammatory properties.